CC2571 is the 8 channel version of the CC257x ANT network processor family from Texas Instruments with uniquely integrated ANT-FS Client, file system and AES-128 encryption. It also support +4dBm transmission power, the high resolution RSSI reading. The part is ideal for applications like mobile health hub device that demands file storage and secure transfer. QFN 6x6 package. 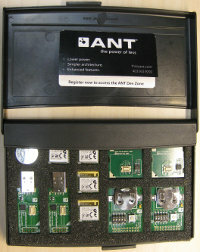 Discuss this product at the ANT forum adn TI E3E Community.